This large Antique Lingam Singing Bowl, circa 1800, is simply unique in that it is the first Talking Lingam I have encountered in 30 years of collecting. It’s a beautiful bowl too, superbly crafted, and counts among my personal favorites. This is a rare large and heavy bowl for a lingam. It has a thick, smooth, and gracefully curved high-sided wall, and a wide triangulated grooved lip. There is a neat pointed lingam at its centre surrounded by circles, and a nice matching navel or yoni underneath. A well-defined incised band encircles the inside of the bowl about a third of the way up from the bottom, and this proved to be a marker for the water level that’s needed to make the bowl talk. The fundamental note is a rare middle A (444Hz) when struck with a padded mallet, and a middle Bb (452-253Hz) if struck with a harder one. The note is both piercing and vibrant with a subtle pulse. The rim note is hard to play and needs experimentation with a variety of playing techniques and ringers to discover which works best (this difficulty accounts for the 25% price reduction). One should bear in mind that lingam bowls are essentially ritual and ceremonial objects, and more likely struck than played. However, a unique characteristic of this ancient lingam bowl is its talking ability. This is achieved by filling it with water to the level indicated inside, and then striking it and rocking it back and forth. The sound is strangely haunting and, to my mind, reminiscent of a wolf’s howl. Very few singing bowls are capable of producing this sound, which I understand to be used by shaman as a vehicle or gateway to another level of being. 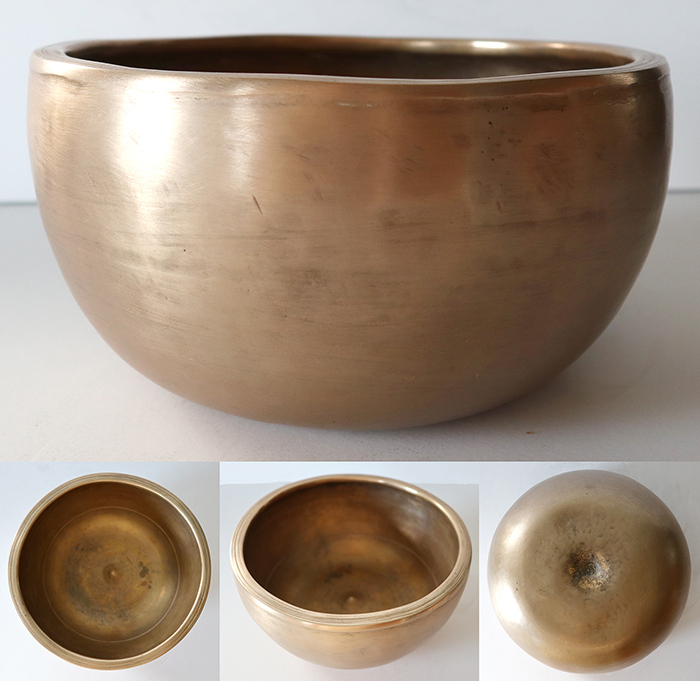 This unique and beautiful antique lingam bowl has a glorious golden bronze colour and is in superb structural condition, clean, and free of stains and blemishes. A Tibetan silk brocade bowl cushion, a padded striker, and a selection of ringers are all included in the price.